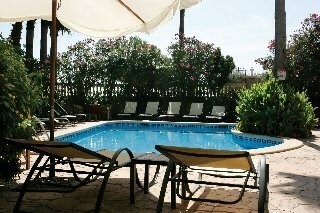 The 4 star Ciutat Jardi hotel is a very special place to stay. Opened in 1921 it was declared a National Tourist monument in 1986 and is the oldest hotel in the bay of Palma de Mallorca. Its historic charm and modern comfort make it ideal for a relaxing holiday. Located directly on the beach guests will enjoy the calm at the hotel while still being only about 4 km from the busy city centre. Other interesting attractions close by include the Cathedral-Historic District (4.5 km), the airport (2.3 km) and a golf club (6 km). Public transport is easily accessible from the bus stop only about 150m from the hotel. FACILITIES: Striving to offer their guests not only the best location, but also the best service, the Ciutat Jardi boasts a wide range of facilities at the hotel. The hotel's bar and restaurant take care of the culinary enjoyment of the guests, the latter offering the possibility to enjoy your meal in the hotel's garden in the summer.